In this fast growing sport of adult flag football, Triple Threat and Flag-a-Tag have established themselves as the two best flag football belts of 2019. Often these are required flag football belts by city parks and recreation leagues, independent leagues and can be found in the equipment bags of pickup game organizer’s across the country. Which one is really the best of the best? Let’s take a closer look at the top-rated contenders of this elite flag football belts and flags matchup – Triple Threat vs Flag-a-Tag. Flag-a-Tag Sonic Boom Flag Belt Review: The Flag-a-Tag Sonic Boom Flag Belt is a unique product to the adult flag football game. The patented release system is what sets it apart. There is a distinct “pop”, or “sonic boom” sound generated from pulling the flag from its belt. This helps let referees know when and where the player’s flag was pulled, which results in more accurate spotting of the ball. Additionally, Flag-a-Tag Sonic Boom belts comes in an assortment of colors. Currently, the flags and belts come in five colors gold, kelly green, royal blue, white, scarlett red to complement your team jersey colors. Most leagues will not allow flags and belt colors that fully blend in with team jerseys and shorts, so this is a great way to contrast the colors of your flag belts to your team uniforms without any additional alterations. These belts are easily adjustable to fit everyone from that slim speedy WR to the heavy weight Offensive Linemen. That said, sonic belts can be ordered in two alternate sizes. First, the smaller belts are measured at 42 inches, while the larger belts are 52 inches long. The length does not include the clamp that secures the flag to the belt around the waist. The “loop buckle” allows the belt to secure around the waist and allows for players to tuck the belt material through the loop for a comfortable fit, without a ton of left over slack on the belt. Therefore you won’t have to worry about the belt dropping down your hips as you run a deep post to the end zone or scramble down the field for additional yardage. Each belt comes with two flags apiece, one on each hip. The flags are built durably and won’t rip from a simple pull. In fact, these flags are known to withstand the rigors of many seasons of play before needing replacement. The flags are measure 17 ¼ inches long and two inches wide, which is also a standard size for most leagues. This means a flag that is not so long that a player can grab it from a yard away, but not so short that it’s impossible to pull from close range. Ultimately, the measurements of these flags give the defenders enough surface area to make the stop, but still leaves enough space for the ball carrier to avoid the pull. Also, these flags, and the clip that they fit tightly into, is what creates the patented “sonic boom”, or pop, to signal the end of a play when the flag is snatched. This loud pop sound helps self-officiated games continue on with fewer arguments over where to spot the ball and begin the next play, as well as for refs to be able to make accurate calls in an organized league. With only two flags per player, defenders must have great hand-eye coordination when making a tackle. Furthermore, there has to be enough pressure for the flag to separate from the belt. Players won’t be able to just barely grasp the flag and have it fall off. Tough and flexible material: long lasting equipment that is less likely to rip or break after limited use. This is really important, especially if you’re running a weekly pickup game, providing gear for anyone who shows up. You likely aren’t charging anyone as an organized league would, so it’s even more important that the equipment you invest in, last for the long run. Makes a “pop” sound when flag is pulled from belt: the patented “Sonic Boom” makes it easier to identify when the play is over and where to spot the ball to start the next play. Adjustable belt: secures in front, through a looping clip that allows for players of all shapes and sizes to enjoy a secure belt that won’t fall off during all the cuts and breaks of fast-paced flag football game. Triple Threat Flag Football Belt Review: Is there really one best flag football belt to consider? In the flag football world, it comes down to two contenders, Flag-a-Tag, which we’ve already reviewed at length, and Triple Threat, which is the only other perennial powerhouse to contest for the title of best flag football flags. Triple Threat flag football flags function quite a bit differently than Flag-a-Tag. The first feature you’ll notice is that this belt lives up to its name; there are three flags per belt. Triple Threat belts come in a standard white color with four color options of flags: blue, green, red or yellow. On the flipside, in the case of Triple Threat, all is one. That is, the belt and all three flags are all one piece. Each flag – which is made of a heavy vinyl material – is individually stitched to the belt. Once a defender gets a grip on any one of the three flags on this belt, the entire belt is designed to unbuckle from the front and be pulled off to mark the player is down. Triple Threat belts may not create any special sounds when pulling them, but with the design of these flags it’s much easier to put the belt and flags back on and be ready to go for the next play. In the middle of a game, you need to be able to put the flag belt up off the field and put it on quickly. You don’t want to waste a timeout just to get your belt back on. You might assume that since the flags don’t actually come off the belt, that it might mean the flags will rip more easily. However, the Triple Threat flag football flags are built like a Linemen in the trenches. These flags are tough and they last through seasons of aggressive, competitive play. Flags are sown on to belt: sturdy stitching from flag to belt means that you don’t have to chase down single flags. These are durable vinyl flags that last for many, many games of intense flag football. Multiple color options: your team can pick from green, yellow, red or blue, green, red or yellow, which gives you the choice to contrast (or blend in) flags with your uniform colors. Large adjustable, comfortable belt: fits all adult male and female shapes and sizes. Adjust at the loop of the belt. Clip on in front to secure: wrap around your waist and clip the belt from one end to the other. Simple and effective. Pull one flag, entire belt comes off: very easy to put back on. Just pick up the belt and clip it back on. You’re ready to go for the next play! One More Flag Football Flag Belts to Consider: look out for one more belt to consider when buying flag football flags. 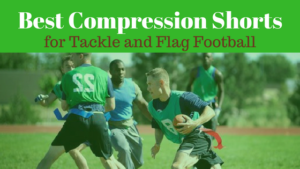 Champro A105 Flag Belts Review: Ultimately, the Triple Threat vs Flag-a-Tag belts is the main matchup when considering the top options for the best flag football belts and flags for competitive adult flag football. If you’re simply looking for a low cost option for flags in order to play a more recreational game of flag football – or if you’re supplying equipment for a massive pickup game – and you prefer the Triple Threat flag design, rather than the “pop” style flags, then it may be worth giving some consideration to the Champro Flag Belts. Triple Threat and Flag-a-Tag are the only flags to really consider (unless you’re on a budget or need only one time use – in which case Champro, in my experience, meets expectation). Champro A107 flag belts are comparable to the Triple Threat flags. The design is similar, but not identical. Like the Triple Threat belts, Champro belts feature three flags per belt. The difference is that they are not stitched to the belt. Instead, the flag is looped up and over the belt and is stitched to itself, which creates a small loop, and the belt slides through the loops of the flags. This creates a flag belt that gets pulled off in one piece, just like the Triple Threat. However, since these flags are not stitched to themselves, the individual flags often slip off the belt and get loose on the field. This slows the game down in big way and forces players to readjust entirely too much. Long story short, Champro belts are a decent option, but they’re not built of high quality material, which is why they’re a distant third in this two-contender competition. Whether you’re a team captain supplying your team for a competitive 4v4 up to 8v8 league play, organizing a weekly flag football pickup game (in which case, you may also want to check out our review of the best flag football kits and sets), or hosting an annual Thanksgiving Day Turkey Bowl event with family and friends, these are the best flag football belts brands to consider if you’re serious about getting your game on.